I am sorry for neglecting this blog for so long. I have tried to write a posting several times in the last week or so, but I lose interest so quickly. I think I have a lot to say but when I'm staring at the computer screen nothing motivates my fingers to move over the keys. It's Friday night and I had a long, ugly day at work. I left around 5:30 and hurried home. Mr. Grumpbump and I made a trip to Michaels. I bought baby yarn because I'm knitting a baby blanket for Mr. Grumpbump's niece, who is having her first baby this fall (she's having a boy). While it's true that I have a stash of baby yarn from the last blanket I knitted, I fell in love with some beautiful blue and green skeins of yarn. I really dislike the Michaels that is close to my home. The yarn section is always so messy and under-stocked. I wish there was a Hobby Lobby nearby. The only one in my town is near my office but generally I have a hard time leaving for lunch. It is my new favorite big-box yarn store. The baby blanket I'm knitting is the gradient garter pattern, which I've previously done. The problem with the last project was that the yarn would get ridiculously tangled. I'm not making that mistake this time. 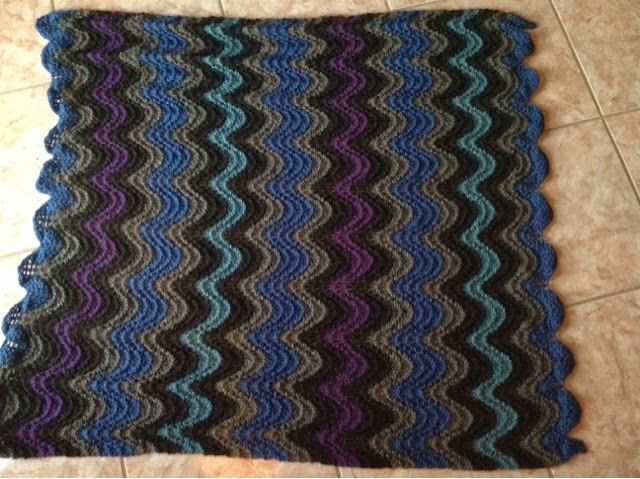 As for my other projects, the third ripple afghan is still on needles, having been so long neglected. I really don't have that much more to finish but other projects keep getting move up in priority. 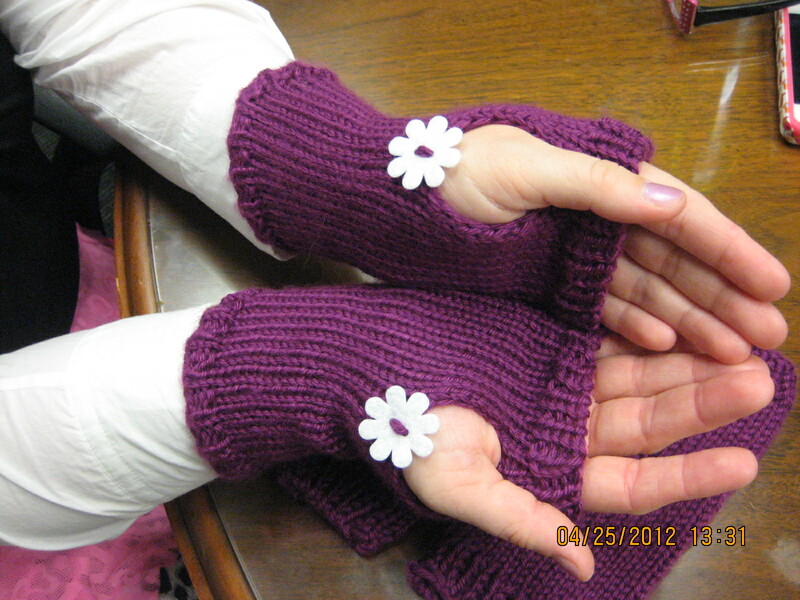 I knitted these really cute and super simple fingerless mittens. I made them for a friend at work and we added some buttons to give them a funky, quirky look. I had to add the felt white flower "button" at the inside beginning of the thumb gusset because there is a gap where the knitting goes from in the round to back and forth. I could not pull the yarn tight enough to close the ladders that were formed. I even tried to add more rows but nothing seemed to work. So I just covered up my mistake. I'm also knitting a two-color scarf for the same co-worker. I really should try to finish it this weekend for her. She will love to model the scarf (as she did the mittens above). 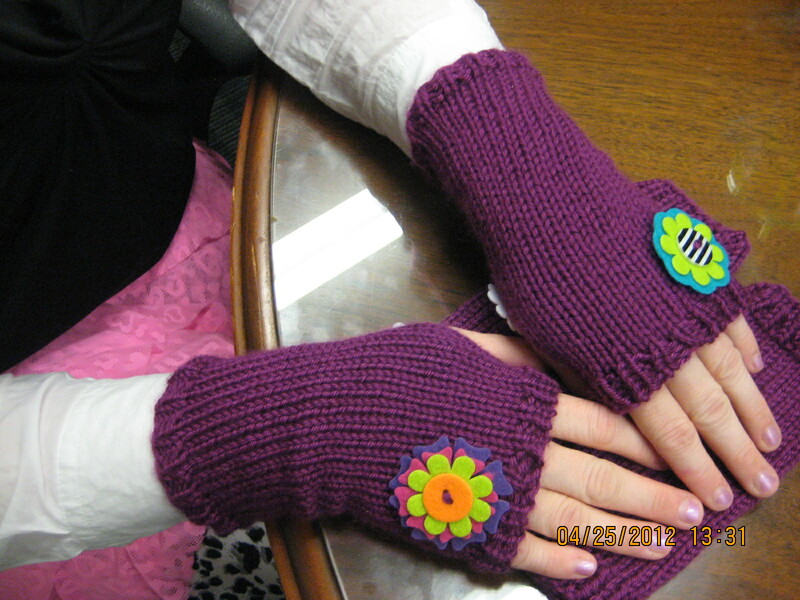 The colors are very bold and eye-catching (pink and green and purple and yellow). 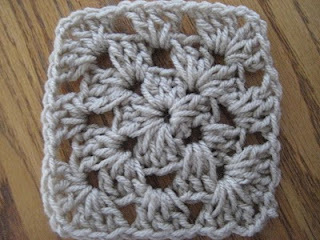 Also on some needles around here are a few washcloths. Sometimes it feels like I am going backward in my knitting, as if I'm not progressing. But knitting is also about relaxing and de-stressing for me so I can't be too critical in my thinking. So I have projects strewn about the house and have not left much room for the cats. Tigger is a great cat - he loves to be near us. When Mr. Grumpbump and I are outside of the patio, he goes meow crazy and yells at us to come back inside. He doesn't like being left alone.